One Queen & 20 Richmond Street East is part of an exclusive group of LEED EB (O+M) Gold Certified Buildings in Canada – as of January 2015, only 54 buildings have achieved this prestigious certification in Ontario. This achievement was possible due to the significant physical and operational improvements made to increase occupant comfort and satisfaction, while improving energy performance and reducing the environmental impact of the building. Low flow plumbing features installed, resulting in 30% less water consumption than the LEED baseline amount. Non-emergency interior lighting turns off automatically after hours, preventing light pollution. 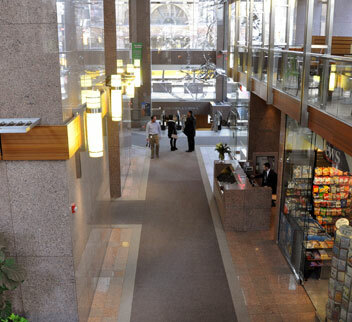 With an Energy Star score of 73, One Queen & 20 Richmond Street East’s energy performance is 23% better than the median commercial office building. 78% of waste produced at One Queen & 20 Richmond Street East is diverted, reducing the amount of waste sent to landfills. Sustainable cleaning program calls for the use of janitorial products with recycled content and cleaning chemicals approved by EcoLogo or Green Seal. Anticipated savings of 216 tonnes CO2e of annual GHG emissions due to energy efficiency improvements equivalent to taking 45 vehicles off the road for a year.